Limited Time Web Only Free Shipping! Uses minimal water to easily remove dirt, dust and grime — only 1/2 gallon of water per minute! Perfect for around the home, campsite, marina, pool or lake — anywhere fresh water is available! The Hydroshot is the first truly portable cleaning power tool. Just a small amount of water lets you easily and quickly clean and maintain your outdoor spaces without water pressure damage. The long cleaning lance maximizes pressure and directs water where you need it, not on you. Hydroshot's long cleaning lance produces up to 320psi of pressure — The long cleaning lance directs water where you need it, not on you. Watering lance delivers a gentle 94psi spray for watering plants and flowers quickly and conveniently. The Hydroshot portable power cleaner lets you use literally ANY source of fresh water — a bucket, your pool, even the lake — so you can clean wherever it&apos;s needed, without carrying lots of heavy water. Power As Long As You Need It. The efficient 20V Max battery — the same driving force that powers the entire collection of Power Share tools — means you&apos;ll always be ready to take aim and clean at a moment&apos;s notice with maximum Hydroshot PSI. Why choose HydroShot Power Cleaner? Long cleaning lance maximizes pressure and improves accuracy, reach and control. Watering lance delivers a gentle spray for watering plants and flowers. Choose from five spray angles (0°, 15°, 25°, 40° and shower) to tackle your cleaning project. The HydroShot uses whatever fresh water source you have available — so grab your bucket and get your clean on. Our powerful, efficient 20V Max battery powers the Hydroshot and the entire Power Share family of tools. Select the level of power you need — high for tougher cleaning projects, low for watering plants and flowers — with the touch of a button. 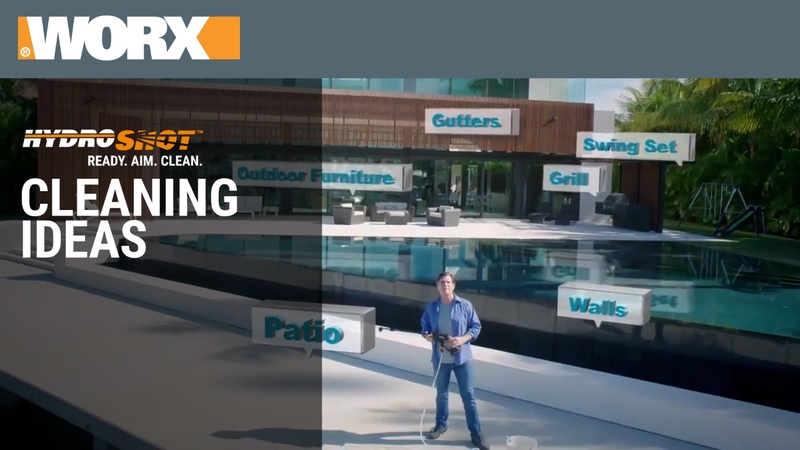 The team of engineers at WORX is filled with consumers just like you. Many of our innovative products are the result of personal experience and need. The origin of the Hydroshot as seen on TV stems from a brainstorm session where we discussed the best way to clean outdoor areas. Our goal was to create a portable, handheld tool that provided the functionality of a pressure washer but minimized the possibility of damage. Grab a bucketful of water and your HydroShot portable power cleaner for quick car detailing. Out on the lake? Drop the hose into the water to easily rinse off your boat. Connect the Hydroshot as seen on TV to your garden hose for a steady stream that&apos;s gentle yet efficient. Easily reach windows on the upper levels of your home. Use the Soap Bottle Hydroshot accessory for extra cleaning. Maintain the appearance of your outside living spaces. Routine cleaning extends the life of your deck and its stain job. Use the pressure-enhancing extended lance to maximize the Hydroshot's water PSI. Attach the Cleaning Brush Hydroshot accessory to give a targeted cleaning to crevices and hard-to-reach areas of patio furniture. Use the gentle setting on the HydroShot power cleaner to keep your plants and flowers watered year round without damaging their fragile leaves and petals. The lance attachment lets you reach high and easily target the spray. Hydroshot portable power cleaner uses a lightweight and efficient 20V MAX Lithium battery, shareable among our entire line of 20V DIY yard and power tools, saving you time and money. That&apos;s Power Share™, only from WORX. The team of engineers at WORX is filled with consumers just like you. Many of our innovative products are the result of personal experience and need. The origin of the Hydroshot stems from a brainstorm session where we discussed the best way to clean outdoor areas. Our goal was to create a portable, handheld tool that provided the functionality of a pressure washer but minimized the possibility of damage. This model (WG629.9) is our tool only model and will only include the tool and accessories. 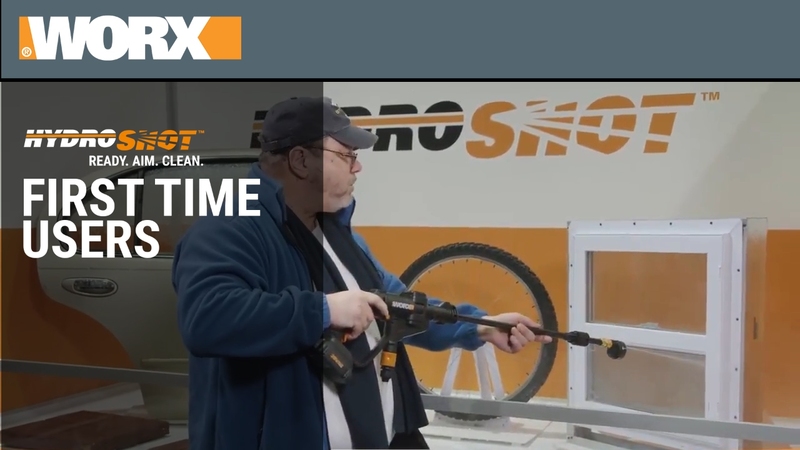 Worx 20V Power Share lets you share batteries and save money - so you can add to your Worx garden and power tools without buying more batteries and chargers than you really need. You can use any Worx 20V batteries and chargers you already have. How heavy is the Hydroshot? The WORX Hydroshot is ultra-lightweight. Even with the battery and lance installed, it only weighs 3.7 lbs. It’s the ultimate portable power cleaner for at home or on the go, and easy to store. 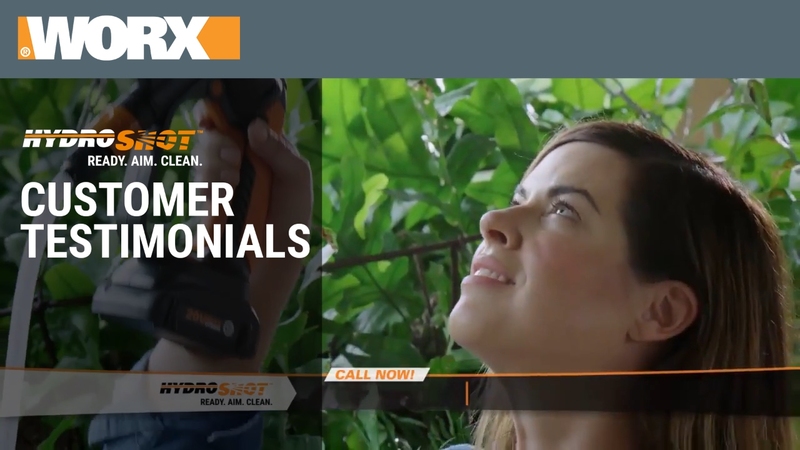 The WORX Hydroshot has two different speed settings – High and Low – to adapt to the task at hand and deliver up to 3 to 4 times the pressure of a garden hose and nozzle. The pressure settings are changed by pushing the button at the top of the handle. High speed allows for more pressure and is best for cleaning with the extension lance and power nozzle. Low speed helps conserve battery run time and is best for watering the with extension lance and the shower setting on the power nozzle. The water pressure will depend on the speed setting used, but can range from 80 psi to 320 psi. - Install both the short and long lance on the Hydroshot. The combination will help increase the pressure of the water output. - Confirm that the water source hose is not being compressed or kinked, or being restricted in any way. The Hydroshot is shown with the long and short lances used at the same time. Do I have to use both when operating the tool? There are two operating modes for the Hydroshot and power nozzle. The first, for lower pressure operation, is using only the short lance and nozzle. This is suitable for light duty cleaning and watering. The second uses the combination of the extension lance with the short lance and power nozzle for higher pressure applications. How do I install the lance assemblies? How do I install the 5-in-1 pressure nozzle? To install the lance to the body of the Hydroshot, align the two projections on the lance with the grooves of the power nozzle as shown in the manual. One side is wider than the other and will only fit one way. Push the lance towards the body of the Hydroshot and, without releasing the pressure, twist counterclockwise until the projection on the lance lines up with the projection on the top of the Hydroshot’s nozzle. Once they are aligned, release. Attaching the pressure nozzle uses the same process. The grooves at the base of the nozzle on the side will line up with the grooves on the extension lance. To attach a garden hose to the Hydroshot, first remove the hose adapter under the body and in front of the handle guard by turning it counterclockwise. You may need an adjustable wrench to remove it. Carefully turn this counter-clockwise. When removing the adapter, be careful not to drop the rubber gasket filter. The Hydroshot will not work properly without this piece. Attach the hose fitting to the Hydroshot and gently pull to ensure it is secure. When removing the hose, be sure not to lose the rubber gasket filter and that it is in place before re-attaching the hose adapter in a clockwise motion. Do not overtighten the hose adapter when replacing it. Yes! With Power Share, you can share the battery and save money. Your WORX Hydroshot can use any WORX 20V battery you already have. By sharing the battery between tools, you’ll always have the power you need to complete any job. - Confirm that the hose is not being compressed or kinked, or being restricted in any way. "For sun-workshipping neat freaks, this rechargeable “power cleaner” is a game changer. Using a special connector out next month, screw on a 2-liter bottle filled with fresh water, then pull the trigger to unleash a 59- to 320-psi spray. Before climbing into the car, blast every last grain of sand off your feet, footwear, beach gear and delighted offspring." Hydroshot Makes Popular Science’s List of Best of What’s New 2017: "Drawing from a hose, bottle or bucket, the motorized pump in WORX’s battery-powered 3.7-pound cleaner pressurizes liquid to a grime-bombing 320 psi-five times the strength of a hose without a power washer’s bulky base." 20V Hydroshot Portable Power Cleaner - Tool Only is rated 4.0 out of 5 by 328. Rated 5 out of 5 by Soonerb1 from Perfect for specific jobs This is a great tool to use when a power washer is too much for certain task. With the spray attachment it is perfect for very specific task. It provides enough pressure to resolve most stubborn mold, stains, etc. Great addition to anyone yard work tools, wish inadvertent one years before. Rated 5 out of 5 by Frankie1 from Great Product This is the most versatile Worx product I own. Give me a bucket of water and I can clean the world. Rated 5 out of 5 by trooperbill from RV cleaner A week after I purchased the Hydroshot I used it on what it was purchased for, my 2018 Tiffin RV. I only used four buckets of water doing one side of the 36 foot vehicle. Wet, soap and rinse. Does the job and with a lot less water. Great product.